Thank you for donating to Susan G. Komen. With your help, we're moving toward a world without breast cancer. Your gift could provide a breast prosthesis for an uninsured or underinsured woman in need. Your gift could provide a screening mammogram to an uninsured or underinsured person in need. Every 60 seconds, somewhere in the world, someone dies from breast cancer. Your gift will help save lives! Your gift could provide a one month supply of Tamoxifen, a drug used to treat breast cancers that rely on estrogen for growth, to a patient in need. Your gift will help us reach our bold goal to reduce the current number of breast cancer deaths by 50% in the U.S. within the next decade! Yes, I would like to receive communications from Susan G. Komen®. Yes, I would like to receive text messages from Susan G. Komen®. Honor or Memorial Gift (optional) Yes, this gift is in honor or memory of someone special, and I would like a tribute card delivered by postal mail. Please don't display my name on the website. Thank you for making a donation on behalf of Devon Blaine. 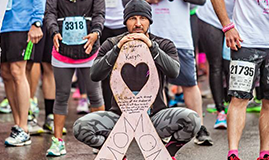 Thank you for making a donation on behalf of 2019 Komen Los Angeles County More Than Pink Walk.